How will #cjreform advocates remember the 86th TX Legislature? As always, I've ordered a transcript and will add it below the jump when it comes back. Hope you enjoy it. The Texas Legislature has its best-ever chance to abolish the Driver Responsibility surcharge before it in HB 2048 (Zerwas). All the major interests have signed off. Early in the session, leadership appeared prepared to (finally) move on the issue, and the bill was voted out of committee in early April. But the legislation remains stuck in the House Calendars Committee and has yet to be considered, much less set for a vote, on the House floor. Although, officially, the last House calendar is May 7, bills must be placed on a calendar several days before - probably by the 1st or the 2nd - to be heard before the deadline for the House to consider House bills. Every legislator knows about problems with the Driver Responsibility surcharge because they all get constituent calls from people whose lives have been ruined by this ill-conceived government boondoggle. Nobody likes the program who's not receiving money from it. But those special interests were so powerful, the money had to be found for the program to go away. HB 2048 solves that problem through several sources. It increases fees on traffic offenses by $20 and adds a $2 fee to auto insurance policies. That latter is apparently the hold up: Insurance industry lobbyists are fighting the $2 fee. But legislators should ignore them. The problem with the Driver Responsibility program is precisely that it relied upon a small number of mostly impoverished people - folks caught driving with suspended licenses or without insurance - to pay for trauma-hospital care. But that's the sort of classic public good whose cost should be spread among everyone. After all, anyone may eventually wind up in a trauma hospital. A few other, disparate critics object to the new, stiff criminal fines for DWI, which replicate high DWI surcharges under the Driver Responsibility program, re-labeling them a criminal fines instead of civil penalties. And to be clear, Grits isn't a fan of that part of the bill. We know 44% of drivers can't pay fines at that level (because that's how many DWI offenders didn't pay the identical surcharges), so there's a real sense in which they're setting people up to fail. The flip side is, under the status quo, DWI offenders still owe the same amount, just as civil surcharges instead of criminal fines. The difference is, judges can waive criminal fines but cannot waive surcharges. So there's more prospect for relief under HB 2048 than those drivers would have otherwise. To recap: There are 1.5 million people with licenses suspended because of the Driver Responsibility surcharge. Those surcharges will be voided and those folks can get their licenses back. Moreover, while the DWI folks still get large fines, they only made up 12 percent of people with surcharges. So 88 percent of people who would have previously gotten a surcharge will avoid them going forward. Helping 1.5 million people at a whack, plus eliminating 88 percent of the problem going forward, makes this a Very Good Bill. The DWI fines are an unfortunate compromise, but even for those folks, they're better off if judges can waive those fines. Since this terrible statute first passed back in 2003, there has never been a better opportunity to eliminate this program than right now. Grits hopes the House Calendars Committee will set this legislation on the Major State calendar at the earliest possibility and leadership strongly supports it. Every day they dawdle risks Texas wasting two more years before this longstanding problem is addressed. UPDATE: Hurray!! This bill was added to a House floor calendar for Monday, April 29, meaning it still has plenty of time to pass. Thank you, Calendars Committee! As bills are considered at the Texas Legislature to restrict Class-C misdemeanor arrests, Austin PD revealed that new policies limiting such warrantless detentions have radically reduced their number. "In the first three months of the year," the Statesman reported, there was a 57% decline over 2018 arrest numbers." “If an officer came across an individual that was committing a violation that was eligible for cite and release, we used to have a long list,” Manley said. “I believe it was 11 disqualifiers, or reasons that the officer could state for making the arrest otherwise.” Police now have only four criteria that could be used to make the arrest versus issuing the citation, he said. The officer must be satisfied that the person has fully identified themselves. The officer has to believe that the safety of the person or property would not be endangered. The person must not ask to be immediately taken before a magistrate judge, which is allowed under state law, Manley said. The offense also must not involve exposure with sexual intent, for which police will always make an arrest. Offenders suspected of driving with an invalid license won’t be released if they were involved a serious crash and deemed to be at fault, or if their license was suspended or invalid because of a drunken driving offense. Maybe the most controversial reason that no longer justifies arrests in Austin: an officer's desire to search a vehicle to investigate potential crimes beyond the traffic offense for which a driver was pulled over. Austin PD policy no longer condones Class C arrests as an investigative tool on the roadside. We know a lot more now about these arrests for petty offenses than we did in the aftermath of Sandra Bland's death nearly four years ago, much less 20 years ago when Gail Atwater was pulled over in Lago Vista, presaging a legal battle that took the issue of Class-C arrests all the way to the US Supreme Court, where she lost 5-4. The SCOTUS majority in Atwater's case consoled itself that there was no evidence Class-C misdemeanor arrests in Texas were at "epidemic" levels. Now, we have solid evidence that they are. Texas Appleseed analyzed jail bookings for 11 of Texas' 254 counties and discovered more than 30,000 Class C arrests in a single year, ranging from seven (7) to 16 percent of jail bookings in counties studied. Meanwhile the Sandra Bland Act, passed in 2017 by the Texas Legislature, required new reporting by law enforcement on Class C arrests at traffic stops, separating them out from arrests for warrants or more serious Penal Code violations. When Just Liberty analyzed data from the largest cities and counties (PDs in towns bigger than 50,000; sheriffs in counties bigger than 100,000), there were nearly 23,000 Class-C-only arrests in 2018, with nearly 5,000 more made by Texas DPS troopers. Overall, Texans were arrested at about one out of every 150 traffic stops. But in some jurisdictions, the proportion was much higher: Waco PD reported arresting 4.5 percent of drivers its police officers pulled over, or roughly one out of every 22 drivers. Overall, recent findings seem pretty consistent with past estimates. In 2016, an analysis of Harris County jail bookings by the Texas Criminal Justice Coalition found Class C arrests accounted for 11 percent of jail bookings in Texas' largest county. In Travis County, the Statesman reported, Class-C misdemeanors accounted for 12.5 percent of jail bookings in 2017. Those numbers fall squarely in the middle of the range Appleseed discovered. Further, we know Texas municipal judges and Justices of the Peace issued more than 2 million warrants and capias pro fines for Class C misdemeanors in 2018, down from nearly 3 million just a few years ago. And we know that 524,628 people in 2018 satisfied their Class-C-ticket debts with "jail credit." Indeed, that figure is down significantly: In 2012, according to the Office of Court Administration, 820,231 people sat out their Class C fines in jail (combining totals for muni courts and JPs - select "Additional Activity" under "Section" to query on jail-credit data). So we can say with confidence that Class C misdemeanor arrests are common, accounting for a significant portion of Texas jail bookings. Further, we know that they're not just happening at traffic stops, but that a large number of Class-C arrests occur in other settings (because the jail bookings numbers are so much higher than the traffic-stop numbers). Finally, we know that Class-C warrants have become ubiquitous, and hundreds of thousands of Texans end up in jail over them every year. Texas muni judges and JPs issue millions of such warrants annually and they never expire. Austin PD's experience tells us that Class-C arrests can be radically reduced without harming public safety. And the data tell us they're not the only Texas jurisdiction that would benefit from such a policy. The kerfuffle over Dallas District Attorney John Creuzot's rather modest decarceration proposals, discussed in this Grits post upon their announcement, has taken on rather telling and delicious overtones I had not expected. What a delight! The DA's law enforcement critics came off like a Greek chorus of scalded cats. And I loved Governor Abbott in his new role as Inspector Javert! The howls of recrimination from the usual tuff-on-crime crowd, using every nasty tactic in their rhetorical arsenal, could be heard from orbit. But the public hasn't sided with the lock-em-up hard-liners as reflexively as in the past, and so far, Creuzot hasn't backed down. Best of all, at least for those of us who view all this weeping and gnashing of teeth as essentially performance art and judge it based on its entertainment value: Because Creuzot's policies are actually entirely modest and reasonable - not remotely as aggressive as other recently elected "progressive prosecutors" like Larry Krasner or Rachel Rollins - his critics look like buffoons, making outlandish claims that everyone can see on their face overstate and over-dramatize the issue. The Combined Law Enforcement Associations of Texas immediately went to their go-to move: they called for Creuzot to straight-up resign, the equivalent of their frequent "no confidence" votes staged whenever a police chief disagrees with their affiliates locally. Notably, this tactic was promulgated in books and lectures by CLEAT founder Ron DeLord for two decades, most prominently in a police-union leadership textbook titled, "Police Association Power, Politics, and Confrontation." However, DeLord, who is a self-branded acolyte of the Saul-Alinsky school of organizing, has more recently walked back his call for confrontation tactics by police unions, suggesting police had gained so much power that they now face an inevitable backlash. And this appears to Grits to be an example where the union has overreached. A CLEAT spokesman declared, "When he was campaigning for the office, we don't remember not prosecuting crime as part of his platform." But that just shows they weren't paying attention during the campaign. The group I work with, Just Liberty, co-hosted a DA candidate forum in Dallas where Creuzot discussed non-prosecution of petty offenses and promised to produce this memo with the details within a few months in office. He wasn't specific about up-to-$750 theft, but he was about criminal trespass, and in general he ran on a platform of reducing incarceration, de-emphasizing low-level offenses, services instead of prosecution for the homeless, and using prosecutorial discretion to stop punishing the poor. No one who heard his campaign pitch would be surprised at this recent news. Here's the absurd part: Dallas PD isn't arresting in these low-level shoplifting cases, anyway, precisely because they're too small-time to bother. Reported the Morning News, "the Dallas Police Department, shorthanded as it is, can't respond quickly to low-priority crimes like shoplifting." So there's some blame shifting going on here: Cops aren't arresting in these cases anyway, and have found an opportunity to shift responsibility to the the District Attorney. Even if they get what they want, though, the storekeepers aren't better off. Creuzot is trying to make the best of a bad situation; the union is taking politicized pot shots. Some of the local municipal police chiefs joined in the fun, even going to far as declaring they'd begin to prosecute these thefts in municipal courts as Class C misdemeanors. Those offenses do not carry jail time as a possible punishment, only a fine up to $500. But we're only talking about cases in which poor people are stealing basic necessities. How is fining them going to help? Who imagines they can or would pay? Like I said, delicious! The unexamined assumptions and muddled thinking are just splayed out for everyone to see. Creuzot's memo turned out to be a Rorschach test that tells us more about whomever is interpreting it than it does about the practical effects of his policies. The most brilliant, glorious example of that had to be Governor Greg Abbott's pair of tweets. They were amazing, a magnificent fusion of Inspector Javert, Mr. Burns from the Simpsons, and Scrooge McDuck! Opined the Governor, "If someone is hungry they can just steal some food. If cold, steal a coat. Where does it end? It's wealth redistribution by theft." The responses were perfect. I can't do them justice, go read them for yourself. Then, after pausing for a bit to construct a tweet declaring all property taxes are theft (! ), Abbott weighed back in, responding to a constituent who suggested that the problem of hungry people stealing food or people stealing a coat in the winter to keep warm might be resolved by other means. TX provides for the hungry and needy through TANF and other programs. You proved my point. You & others reveal that STEALING is ok when people want things: cell phone, tire, lawn mower, almost any item you see in a store or in the open. That's socialism. So let's be clear: Government programs that help the poor? Those are not "socialism." Instead, socialism is direct theft of private property by criminals, says the governor. (Like property taxes, apparently.) In his mind, police aren't arresting criminals, they're arresting socialists! Grits predicts this will all blow over soon because nobody has the authority to oust Creuzot over it, he's perfectly within his rights to exercise his discretion this way, and in fact if a Republican DA had done it, Abbott likely would never have said a word. Again, to my mind, this should all be viewed as performance art. Everyone had a role to play in the media-driven melodrama, and the entire cast hammed it up admirably. I'm already looking forward to the sequel. As the House Criminal Jurisprudence Committee today prepares to hear HB 2754 (White), the committee substitute to which would limit most Class C misdemeanor arrests (with certain public safety exceptions), Just Liberty put out a new analysis of data titled, "Thousands of Sandra Blands: Analyzing Class-C-misdemeanor arrests and use-of-force at Texas traffic stops." The analysis relies on the new racial profiling reports which came out March 1st, analyzing information for Texas police departments in cities with more than 50,000 people, and sheriffs in counties with more than 100,000. Here's the table from Appendix One of the report with the underlying data. Readers will recall that new detail about Class-C arrests, use of force, and outcomes of searches were added to the report as part of the Sandra Bland Act passed in 2017. But the provision to restrict Class C arrests was removed before the law was passed. So HB 2754 amounts to unfinished business for those concerned about what happened to Sandra Bland. Our findings: The practice of arresting drivers for Class C misdemeanors - not warrants, and not more serious offenses - is more widespread than portrayed by law enforcement. The 96 police and sheriffs in our sample arrested people nearly 23,000 times for Class-C misdemeanors last year, with the Texas Department of Public Safety accounting for nearly 5,000 more. While the average arrest rate at traffic stops is low - a mere 66.7 per 10,000 stops - that's about one arrest out of every 150 traffic stops. And some agencies arrest people much more often. Waco PD stood out the most, arresting people at 451.4 times per 10,000 stops, or at just more than 4.5 percent of all traffic stops in 2018. The new reporting also included data on how often police use injury-causing force at traffic stops. After Austin PD corrected its misreported data, Houston PD stood out with the highest rate of injury-causing force among the jurisdictions in our sample, at 53.2 incidents per 10,000 stops. That's about one out of every 188 drivers pulled over by HPD. These data represent fewer than 100 law enforcement agencies, but more than 2,000 agencies must submit racial profiling reports because they perform traffic stops in come capacity. Agencies in our dataset represent the largest jurisdictions, but not all by a longshot. If we assume that these departments plus DPS represent 60 percent of traffic stops in the state, and that the average arrest rate for the other 40 percent is the same as in this sample, then Texas law enforcement agencies arrested more than 45,000 people at traffic stops statewide last year, the report estimated. These higher-than-previously-understood estimates are corroborated by Texas Appleseed's recent analysis of jail bookings. Examining data from eleven (11) counties, they found more than 30,000 jail bookings where Class C misdemeanors (not warrants) were the highest charge. The difference between analyzing jail bookings and racial-profiling data is that jail bookings include Class C arrests which happened anywhere. The racial profiling reports Just Liberty analyzed only consider arrests made during traffic stops. Taken together, these analyses demonstrate that the overall number of Class C arrests is much higher than anyone ever imagined when this topic has been discussed in the past. At a debate co-hosted by Just Liberty last fall, then-Dallas-DA-candidate John Creuzot promised to produce a memo three months into his term to identify changes/reforms designed to reduce mass incarceration. Marijuana: The Dallas DA will not prosecute first-time offenders unless the offense occurred in a drug-free zone, involved a deadly weapon, or there is evidence of delivery. He also said he'd decline first-time 3rd degree felony THC possession cases, with the same exceptions. Harder drugs: Creuzot will no longer prosecute "trace" drug cases, which typically involve sending paraphernalia to a crime lab to scrape traces for a possession prosecution. In addition, his office will not file drug charges on arrestees until after a lab report has come back, an will ask judges for summons instead of warrants to get those folks back into court. Criminal trespass: Aiming to reduce prosecution of homeless people, Creuzot will decline criminal trespass prosecutions unless they involve a residence or "physical intrusion into property." Theft of Necessary Items: Creuzot pledged not to prosecute theft under $750 "unless evidence shows the alleged theft was for economic gain." Driving With License Invalid: Here's one where he could have gone further. Creuzot announced a "diversion program that will result in charges being dismissed for defendants who clear their drivers licenses." Since most people with suspended drivers licenses had them suspended because of nonpayment of Driver Responsibility surcharges, and since those aren't going away (at least not just because of this announcement), most folks simply won't be able to "clear" their licenses. Instead, he should simply decline prosecution for DWLI, as he's doing for most pot cases. No one needs to be arrested for what in essence is a criminalized administrative violation. Probation: Arguably the most important measure announced when it comes to decarceration in the state prison system is Creuzot's decision to significantly shorten probation stints, a decision with a great deal of evidence-based support. He suggested presumptive probation terms of 6 months for misdemeanors, 180 days for state jail felonies, two years for 3rd and 2nd degree felonies, and 5 years for 1st degree felonies. He also instructed prosecutors to stop revoking probationers for "technical violations" that do not threaten public safety. Regular readers will recall that about half of probationers revoked to prison in Texas have their probation terminated over technical violations. Bail reform: Creuzot established a presumption of release for misdemeanants and state-jail-felony defendants with no criminal convictions in the last five years. If there is clear and convincing evidence the accused will fail to appear or a victim could be harmed, a risk assessment will be used "as a guide for developing appropriate conditions of release," a protocol that will also be applied to more serious offenses. Magistration: "As soon as construction permits," Creuzot will begin assigning prosecutors to magistration hearings so prosecutors "can screen cases and decline to prosecute those cases" that fall within his new policy. To be sure, Creuzot's reform policies are more moderate than those rolled out last year by Philadelphia DA Larry Krasner. (See his memo.) Grits would have liked to see the Dallas DA embrace some of the plea-bargain and sentencing reforms adopted in Philadelphia. But this announcement definitely ensconces Creuzot in the ranks of reform-minded prosecutors; nobody else in Texas is doing more. MORE: Here's the Dallas News' coverage of the memo. During his campaign last year during a debate with Democrat Lupe Valdez, Governor Greg Abbott announced his support for making possession of up to two ounces of marijuana a Class C misdemeanor. But the governor has now backed off of that position, radically limiting his earlier proposal. He's still for reducing marijuana penalties, but only for amounts so small that it won't affect most cases. At the House Criminal Jurisprudence Committee meeting on Monday, Chairman Nicole Collier laid out a new committee substitute to HB 335 (Dutton) to make possession of only up to 2 grams a Class C misdemeanor. On a third offense, charges would increase back to a Class B. She declared the changes were made at the request of Governor Abbott. The governor said last year he did not want to see "jails stockpiled with people who have possession of small amounts of marijuana." But that's exactly what will continue to happen thanks to this change in the bill. Two grams is a very small amount. Texas law currently treats up to 2 ounces as a Class B misdemeanor, which is considered a user-level amount. Most folks buy pot in quantities of an ounce (~28 grams), a quarter ounce (~7 grams), or an eighth of an ounce (~3.5 grams). So this change will keep pot possession a Class B misdemeanor for most people charged with the offense. The same committee earlier approved HB 63 (Moody) making possession of up to one ounce of marijuana a civil penalty. But the governor reportedly favors keeping pot possession in the criminal statutes. In this, Abbott is out of sync with his own party. The Texas GOP state party platform approved last year declares, "We support a change in the law to make it a civil, and not a criminal, offense for legal adults only to possess one ounce or less of marijuana for personal use, punishable by a fine of up to $100, but without jail time." Moody's bill is the closest legislative proposal to that position. 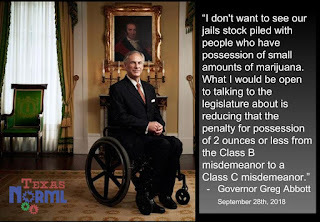 If the scaled-back version of HB 335 is all Governor Abbott will allow to happen, then I suppose, as my father likes to say, it's better than a sharp stick in the eye. But after seeing him campaign on a more aggressive proposal back when he was seeking to appeal to swing voters in a general election, it's discouraging to watch the governor backtrack. In preparation for tomorrow's hearing on HB 482 (Thompson) limiting Class C misdemeanor arrests Texas House Homeland Security and Public Safety Committee, I just watched last session's hearing on Chairwoman Senfronia Thompson's similar bill, which passed out of that committee on a 7-1 vote. First, on defining the problem: the ship has sailed on the idea that Class C misdemeanor arrests are rare or only used in extraordinary circumstances. They happen tens of thousands of times around the state every year. and are a significant contributor to local county jail costs. No need for that debate again. The problem is much bigger than even the most vocal critics estimated. Second, nobody has "Spidey Sense": Almost all the police testimony involved war stories of times when an officer had no evidence of a crime but sensed something was wrong and arrested a serious criminal on a hunch. The problem is, nobody knows how many times officers guess wrong, and the likelihood is, it's a lot. After all, every time a defendant is booked on Class C charges, it means the officer was unsuccessful at finding evidence of anything more serious. And that happens tens of thousands of times per year. In the comic books, Peter Parker may have a "Spidey Sense" that lets him detect danger. But police officers aren't superheroes who've been bitten by radioactive spiders. And they are constrained by legal doctrines like "probable cause" and "reasonable suspicion" that do not concern masked comic-book vigilantes. Third, a police officer opposing the bill outlined a scenario where a suspect left a drug buy and police wanted to arrest them with the evidence, but chose to arrest them for a Class C misdemeanor traffic violation because they didn't want to "burn" their confidential informant. Grits had so many questions on this one! So you're not going to mention the confidential informant or the undercover drug operation in the arrest report, even though you're going to charge the person with drug possession? I am not a lawyer, but wasn't this officer in essence admitting to using Class C misdemeanor arrests to get around the Michael Morton Act and Brady v. Maryland? Nobody asked, but the whole scenario didn't sound kosher. Fourth, nearly everything specific that police named as a problem, like public intoxication or Class-C assault, are excepted in the committee substitute, which allows police to arrest for Class Cs if failing to do so would result in a continued breach of the peace. Finally, the lobbyist for CLEAT repeated a phony re-imagining of the Timothy McVeigh story to argue against the bill. Grits has written about this before. McVeigh was arrested because he informed the Oklahoma state trooper who pulled him over that he was carrying an illegal handgun. That's what he was arrested for, not a fine-only traffic offense. The trooper has said so publicly many times. None of that sounded too convincing, frankly, which I suppose is why the bill passed out of committee two years ago by a 7-1 margin, dying on the General State Calendar on the final day awaiting a House floor vote. Now that the legislation has returned with new life, having been endorsed by both state political party platforms after being stripped out of the Sandra Bland Act in 2017, here's hoping the committee looks favorably on Rep. Thompson's bill once again. It's time is now.